It’s time for the June checkpoint for the 2013 Mount TBR Reading Challenge hosted by My Reader’s block. So far I’ve read 21 books from 24, so I think I’m doing very well! Mount Blanc is 4 810,90 m high. Divided with 24 is 200, 45 m times 21 is 4 209,53 m. In miles that’s 2615,68. Hard one! I read four books made from two of my favorite TV shows (Babylon 5 and Buffy) and a couple of last books from series. So I’m going to go with Willow from Buffy the Vampire Slayer. None of them were difficult. These books haven’t been long in my TBR. I think I’ve had the oldest about two years. That’s Issui Ogawa’s book. I liked it even though it didn’t blow my mind. My newest review: K. A. Stewart: Wolf at the Door. The third book in the urban fantasy series about modern day samurai, Jesse Dawson. It wasn’t as intense as the previous book but I enjoyed it. Sadly, Roc has cancelled this series but the writer is apparently aiming to self-publish the rest. I hope she succeeds. 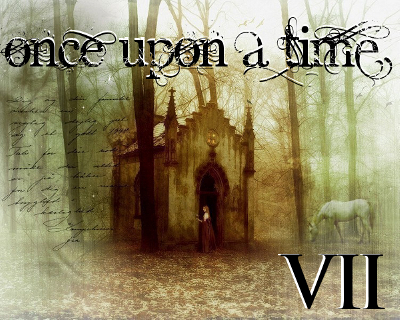 Once Upon a Time VII challenge ended a few days ago. Thanks to Carl from Stainless Steel Droppings for hosting the challenge! I read ten books for the challenge and enjoyed all of them. I signed up for Quest the Second with five books so I completed the quest. I managed to finally finish two fantasy series but started four others. I’ll certainly continue with Jim Hines’ Princess series. In fact, I already have the next two books. I also have Jemisin’s The Shadowed Sun. The first book in an alternate history SF trilogy. 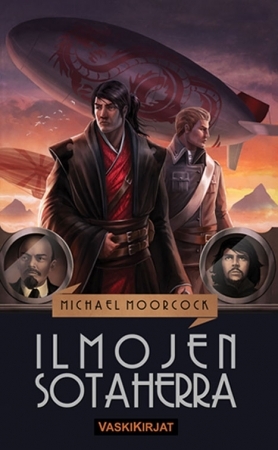 Moorcock, the author, received and has now published. In 1903 the grandfather was sent to Rowe Island to recover from too much work and met a strange man who told the older Moorcock his story and Moorcock wrote it down. The strange man in question is Oswald Bastable, a former lieutenant in the British army. An insurrection was brewing near the borders of the British India in 1902 and Bastable is sent there with a contingent of Indian soldiers to try to find a solution to it. The place they’re sent to is called Teku Benga which is supposedly a cradle of ancient civilizations and has a large army of fierce warriors. They are led by a high priest, Sharan Kang, who invites Bastable and a couple of his soldiers inside. Teku Benga turns out to be a filthy place but with fierce warriors. Apparently, Kang drugs Bastable and his men. They manage to escape into endless caves under the ancient temple Kang brought them to. Then some mysterious force knocks Bastable unconscious. When he awakes, he feels very weak but manages to get out of the caves. Outside, the temple lies in ruins and seems to be abandoned. Bastable can only find a few skeletons. 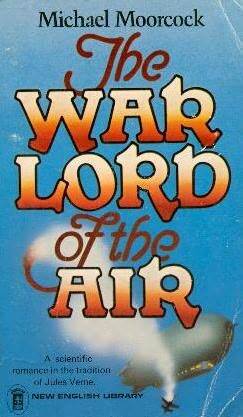 Then, a huge airship flies over the place and Bastable is able to get the crew’s attention. They rescue him but to his shock, Bastable finds out that it’s now the year 1973. At first, this alternate 1973 seems like an utopia: in England, people are well off, wages are high, and the cost of living is low. No major wars have been waged in a hundred years. Britain, France, Russia, Japan, United States, and a few other countries are still empires with colonies. Colonialism is said to make the world more stable and therefore a good thing. However, gradually Bastable finds out that all is not well after all. Bastable is an honorable and patriotic man who doesn’t want to believe that Great Britain could do something wrong. He’s a soldier who wants to serve his country and takes pride in his work. In fact, he greatly reminds me of John Carter. However, it takes a long time for the plot to start kicking in. Also, in addition to Bastable only two other characters are at all fleshed out and they appear after the halfway point of the book. Mostly, that’s because Bastable travels alone and moves quickly from one place to another. Also, the book’s main aim seem to be social criticism and not adventure. I enjoyed the alternate world a lot and wouldn’t mind reading more about it. I think the book was a bit too short to really dig deep into the world; we are told about the nasty things happening in the colonies but not really shown them and it also wasn’t clear how many ordinary people knew about them. The book has several real life people cast in different roles than in real life. Sadly, I didn’t catch any of them while reading but luckily Wikipedia has a list of them. However, the Finnish edition apparently used an older edition: Egan instead of Reagan and Howell instead of Powell. Moorcock criticizes colonialism strongly. The revolutionary characters also have a disagreement over how a revolution is born and should be done. Today the topic of Top Ten Tuesdays is Top Ten Books Read So Far This Year. I’ve listened seven of them so far this year and I can’t really choose just one. They’re all delightful mysteries set in the 1920s Australia. A relisten and one of my favorites in the series. A parody of science fiction /superhero books, starring a genius super villain. A science fiction book focusing on exploration rather than war. Sixth book in a fantasy series set in Stone Age equivalent world. A fantasy book set in a world inspired by Ancient Egypt, with a unique magic system. A fantasy book set in the Aztec empire, with working blood magic. The last book in a series I’ve enjoyed a lot. Another last in a series. The fifteenth book in the series. This time Phryne is asked to solve a series of jewlery thefts on a luxury liner, SS Hinemoa. Four very expensive jewels have been stolen from the ship, from locked rooms. Nobody has been able to find the thief and the the company has had to pay for the jewels. Even though Phryne loves her friends and family, they make a lot of noice and Phryne is ready for a small vacation. So, Phryne and her level-headed companion Dot board the huge ship. SS Hinemoa sails around New Zealand and Phyrne gets to know a lot about that country and especially about the Maori culture. She also gets to know her eccentric fellow passangers, all of whom are suspects because they sailed on the ship during the other thefts, some of the crew, and especially, the band: Mavis and the Melody Makers. But then, one of the passangers is murdered. Death by Water has very interesting descriptions of both luxury ship and Maori culture. In fact, Greenwood says in her notes afterwards that she had to built a model of the ship and researched it throughly. Even though the first class passangers seem rich and therefore happy, most of them have quite dysfunctional relationships. Some of them are also very racist. Each chapter starts with a letter. I wasn’t able to guess why they were included and that wasn’t reveled until near the end. Unfortunately, I didn’t think the mystery was the best of the series. But the characters and the setting more than made up for that. The first in a fantasy duology based on ancient Egypt, The Dreamblood. Gujareen is a small but wealthy country. It’s ruled the Prince who is the earthly consort of the Goddess Hananja. She’s the goddess of dreams, death, and the afterlife. She also has servants who must choose one of the four paths: Teacher, Sentinel, Sharer (healer), or Gatherer. Ehiru is one of the four senior Gatherers. His job is to give peaceful death to the suffering, or the corrupt. In order to do that, he must enter his victim’s dream and make is a peaceful, blissful dream. He also gathers the victim’s dreamblood which is very addictive. So, he, and the other Gatherers, can’t go more than a few days without gathering dreamblood. The Superior of the order decides who they kill, or gather, and Ehiru trusts him unconditionally. However, when the story starts, Ehiru has been sent to gather a foreigner who is supposed to be corrupt. The foreigner doesn’t worship Hananja and he resists the gathering. He talks about how the Gatherers are corrupt and Ehiru is so disturbed that he makes a mistake and destroys the man’s soul. Ehiru is greatly disturbed and goes into seclusion. However, the Superior convinces him to take on another commission. The victim is another corrupt foreigner; she’s an ambassador from another country. Reluctantly, Ehiru agrees and take with him his apprentice. Nijiri is sixteen years old and studying to be come a Gatherer. He has just ended his studentship. Even though Ehiru is in seclusion, Nijiri wants to be his apprentice. Reluctantly, Ehiru accepts him. Nijri was born into the servant class but since he was a young boy, he has lived a pretty secluded life among the priests. Ehiru’s mistake with the soul disturbs Nijiri, but the boy is very loyal to Ehiru and supports him no matter what. Sunandi is Kisua’s ambassador to Gujaareh. She’s also a spy and on the trail of a huge plans. She meets the General who shows her some disturbing things. Sunandi and her young aid Lin makes plans to flee the city so that they can warn the Kisuati leaders but Ehiru is sent to kill her before she manages to leave. Sunandi is able to convince Ehiru that she has found evidence that even the Gatherers are corrupt. Ehiru and Nijiri are disturbed and agree to put Sunandi’s gathering in abeyance for now while they look into it. Ehiru and Nijiri are both devoted to their goddess and have strong faiths. However, they are both tested sorely with the secrets they find out. They can be quite stoic and distant to the reader, too. Sunandi is an intelligent woman and an experienced spy. She’s used to talking her way out of bad situation. Gujareen is based on ancient Egypt and Sudan. I adored the world building but otherwise the book is pretty bleak. The characters have secrets which can bring down countries, they are double-crossed, and should trust no-one. Unfortunately, there’s no humor to balance it. The Gujareen use dream magic, nacromany. The Sharers can use the dreamblood harvested from the dying to use is to heal others. Through her followers, Hananja offers her people a peaceful life: healing during life and a peaceful death at the end. However, foreigners often don’t see that and they call the Gatherers assassins.